“James, a servant of God and of the Lord Jesus Christ, To the twelve tribes in the Dispersion: Greetings. Count it all joy, my brethren, when you meet various trials, for you know that the testing of your faith produces steadfastness. And let steadfastness have its full effect, that you may be perfect and complete, lacking in nothing. If any of you lacks wisdom, let him ask God, who gives to all men generously and without reproaching, and it will be given him. But let him ask in faith, with no doubting, for he who doubts is like a wave of the sea that is driven and tossed by the wind. For that person must not suppose that a double-minded man, unstable in all his ways, will receive anything from the Lord. Let the lowly brother boast in his exaltation, and the rich in his humiliation, because like the flower of the grass he will pass away. For the sun rises with its scorching heat and withers the grass; its flower falls, and its beauty perishes. So will the rich man fade away in the midst of his pursuits. 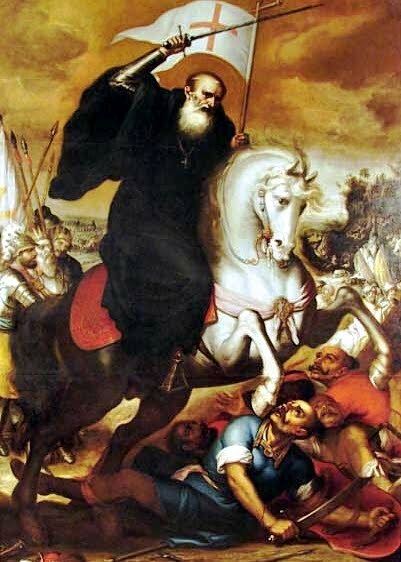 ‘Did not you know that my Lord Jesus Christ, while distributing the other provinces in the world to my brothers, the other apostles, luckily entrusted me the guardianship of all Spain and placed it under my protection? (…) Keep your courage, because I will come to assist you tomorrow, God willing, to vanquish all that big crowd of enemies surrounding you. However, many of your soldiers will be destined for eternal rest and will receive the crown of martyrdom during your struggle for the name of Christ. And so that there is no doubt you will see me dressed in white on a white horse, holding in my hand a white banner. Therefore, at dawn, after receiving the sacrament of penance with the confession of sins, after receiving the Communion of the Body and Blood of the Lord in the Mass, do not be afraid to challenge the Saracens’ squadrons, invoking God’s name and mine, and taking for certain they will fall to the edge of the sword ‘.